Prepare your approach to the barriers by balancing your speed into the first barrier combined with picking the point where you want to dismount. Pick a clean and smooth-ish line along which you can coast while you swing your leg over behind the saddle and balance the bike against your hip. If necessary, check your speed with the rear brake, assuming this is operated UK style by the left lever. Speed it critical - too slow and you will come up short and grind to a halt, out from the barrier. Too fast, and…. there will some sort of unfortunate interface of bike/rider/barrier that will probably hurt. 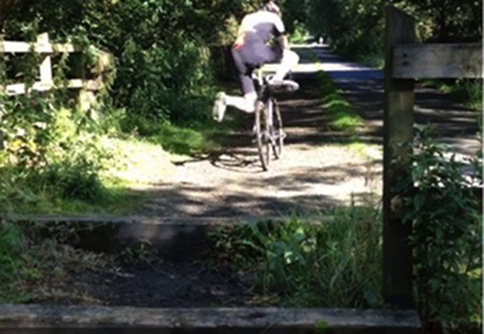 As close as you can, dismount and whilst you start to stride over the first barrier, lift the bike up to clear the barrier. You can do this with your elbow in (saddle/seatpost away from rider) or elbow out (saddle/seatpost next to rider). The conventional way is elbow in as it tends to be safer with the bike higher and away from the body and reduces the risk of banging the bike on the barrier or your body. But taller people may comfortably do it elbow out. You are now over the first barrier safe and sound, and depending on the distance between them, you can keep your bike in the air and run the gap between them or place it briefly and gently on the ground before lifting again before the second barrier. Do what feels best – whether or not you put it back on the ground depends on your speed (or lack of), strength, tiredness and so on. 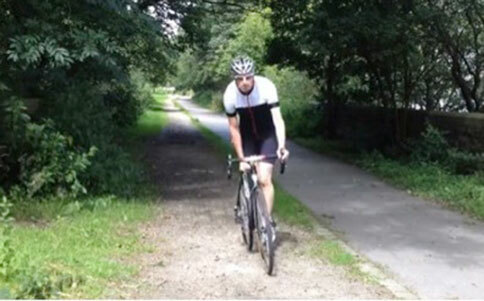 Once you’ve cleared the last obstacle, your goal is now to get back on, pedalling as soon as possible. 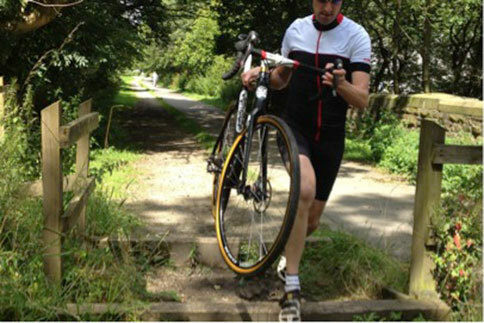 First thing to do is to place the bike carefully on the ground just after you clear the obstacle. Bounce it down wildly and you will drop your chain, bark your shins, trip up or all three. Gently does it. Get back up to speed and, with those remounts you’ve been practising, jump back on and you are away to the next section of the course.